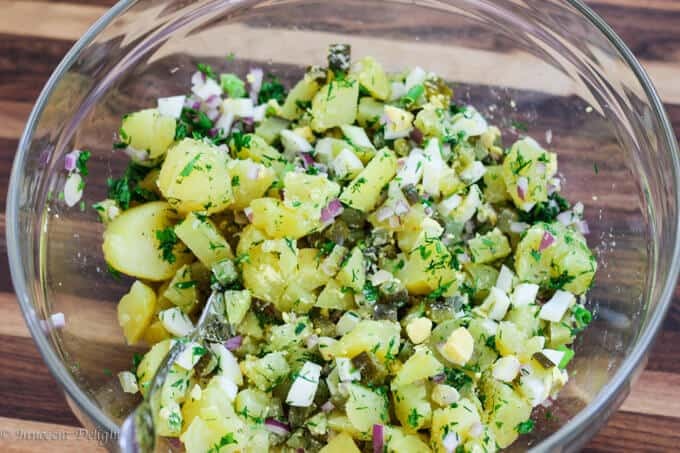 Potato Salad with Eggs and Pickles is super easy to make and it tastes incredible. The combination of eggs, pickles and an assortment of herbs make for a decadent, yet simple and unique dish. You can call it Polish Potato Salad if you wish. 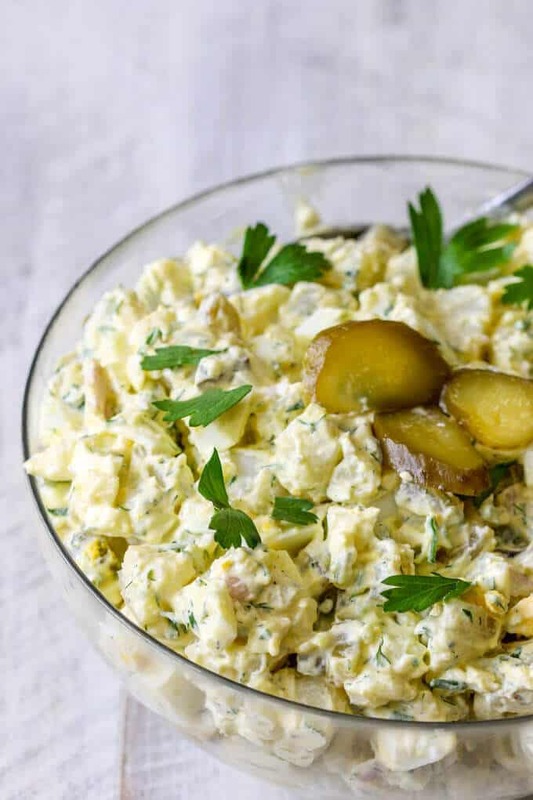 Potato Salad with Eggs and Pickles reminds me of the wonderful barbecue dinners that I used to have back in Poland. This dish was a staple at every gathering. 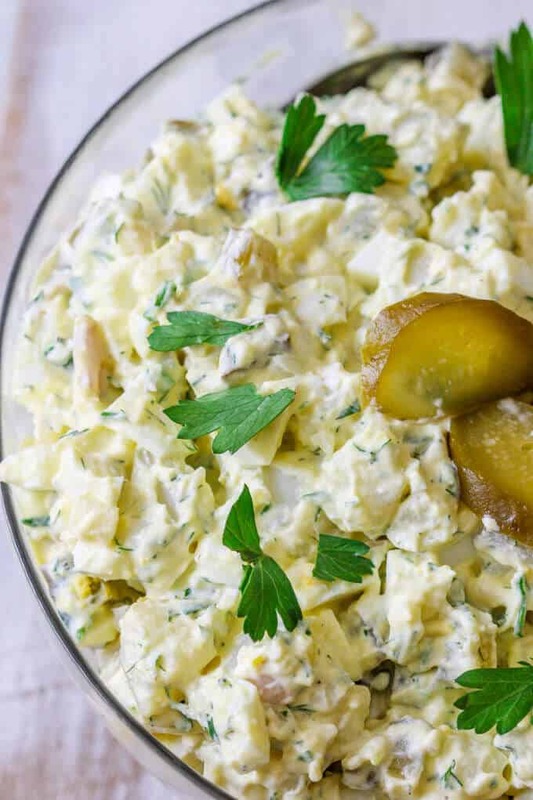 Now, this Potato Salad with Egg and Pickles can act as a perfect addition to your next summer BBQ. 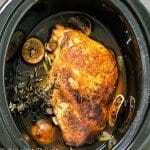 It’s tangy and refreshing, and it pairs well with a variety of meat. Alternatively, it can also act as a separate vegetarian dish. 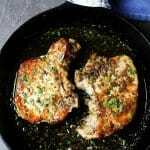 However you choose to utilize it, this dish makes for a great accompaniment to any meal. It seems like almost all nations have their own spin on potato salad. 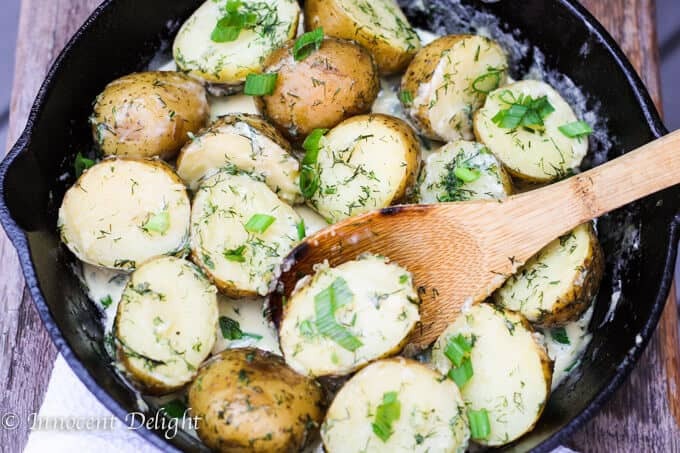 Variations differ by type of potatoes, additional ingredients, sauces, and spices; but they all have one thing in common (obviously)….Potatoes. In all honesty, I think there are a couple of different kinds of potato salads common in Poland. 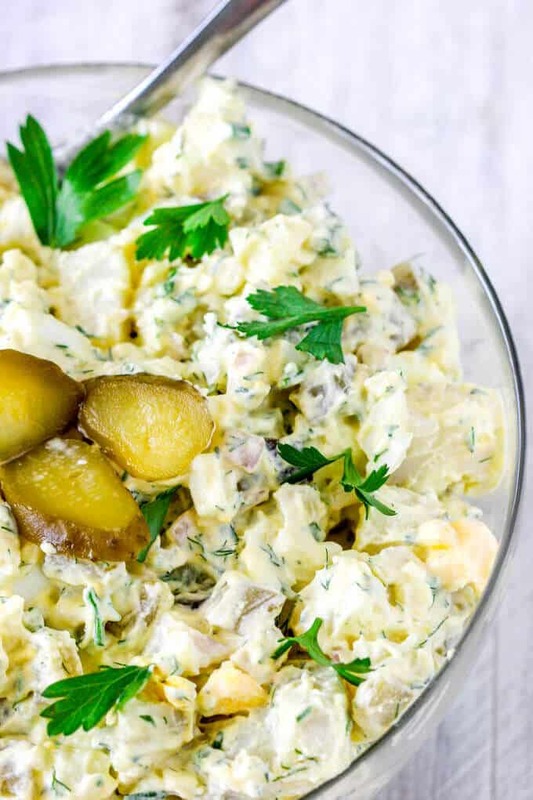 While this post is based after a less typical Polish potato salad, sometimes called the ‘Jewish Salad,’ the most popular is called the ‘Vegetable Salad’ ( in a direct translation: “Salatka Jarzynowa”, also known as Russian Salad or Olivier Salad). The Vegetable Salad contains other root vegetables too, usually also peas, sometimes corn, and sometimes apples. There are several different schools of thought as to how to make this Vegetable Salad, and for sure you can get it in every Polish house. I usually make mine for Christmas and I will certainly create a post about it in the future. 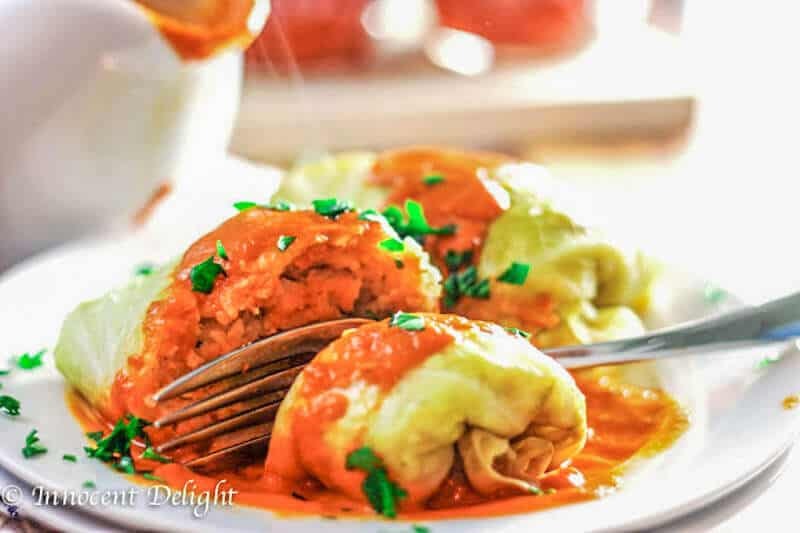 Polish cuisine is famous for its use of potatoes. 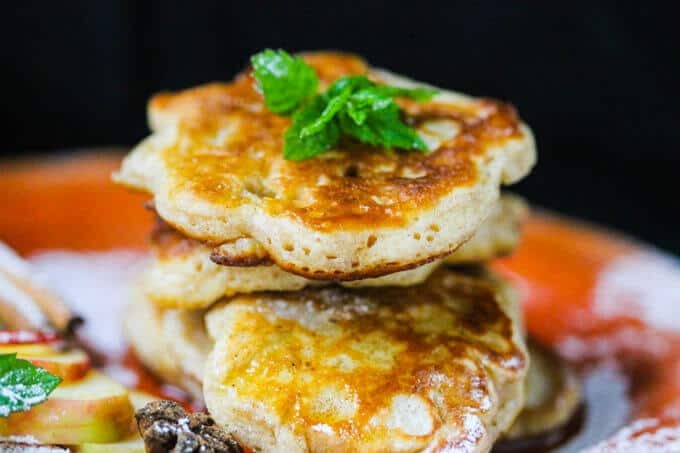 You can find them mashed (like in these Brown Butter Dill Mashed Potatoes), roasted, fried, baked, grated, fried into potato pancakes (like these Super Easy European Style Potato Pancakes), put in pierogis (like these Authentic Polish Pierogi with Potatoes and Cheese), added to soups, and serve as primary ingredients in potato salads. So, coming back to this Jewish/Polish Salad….it seems like there are a lot of influences between Polish and Jewish cuisine. 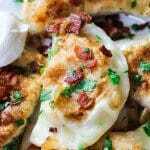 For example potato pancakes, pickles, chicken soup, stuffed cabbage and many more. All really speak to me. While I can’t really tell you more about the origins of this salad, what I can tell you is that it’s delicious! Here’s my secret…I’ve added 3 types of fresh herbs: parsley, dill, and chives, to really capture the taste of spring in Poland. We recently had it with our neighbors who’d invited us over for a BBQ. We paired it with their delicious ribs and shrimp from the grill. 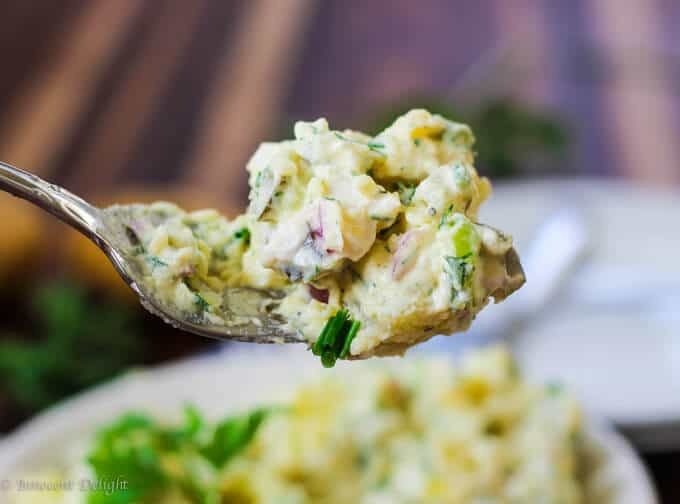 So, if you’re looking for some unique addition to your next BBQ, then use this Potato Salad with Eggs and Pickles recipe and neither you nor your guest will be disappointed. Comments and questions are very welcome. Let me know if you have a favorite potato salad. Potato Salad with Eggs and Pickles is super easy to make and it tastes incredible. The combination of eggs, pickles and an assortment of herbs make for a decadent, yet simple and unique dish. This post was originally published on July 9, 2014, and was since then updated to provide additional information. Which Wine Pairs Well With Pizza? Being German I love potatoes and I love potato salad. This looks like a great recipe. Thanks Gerlinde 🙂 I love German Potato Salad. Do you have one on your blog? Alright. . .now I’m craving a potato salad. Making this one over the weekend! 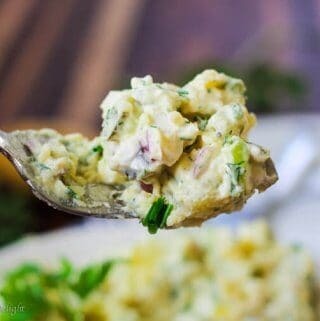 This potato salad looks fabulous!! My family is going to love it. I like that you used pickles in brine!! Awesome recipe! 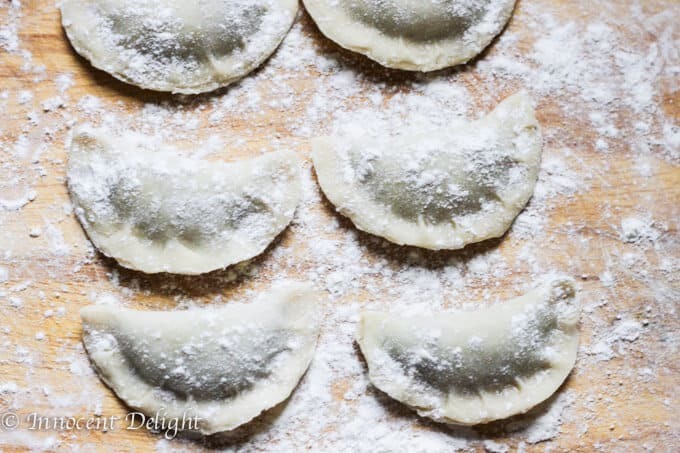 I just love this recipe. It reminds me of something my uncle used to make. The photos are incredible. Makes me want to make potato salad right this very minute. 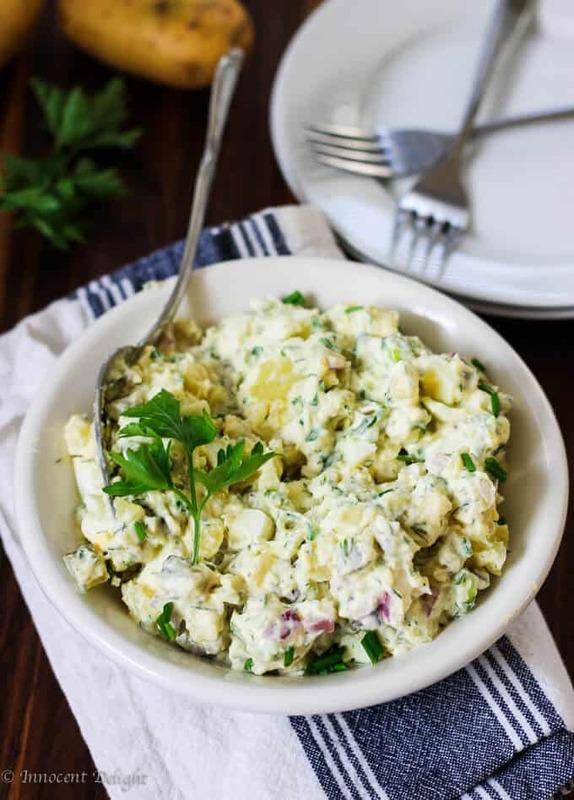 Potato salad is a favorite in our house and they’re so many variations for it. I love the addition of pickles and eggs in this. Absolutely looks perfect! I love adding eggs in to our potato salad too. It makes them extra creamy and gives them a nice little protein boost too. This is a great salad to take to our Summer BBQ’s! I love it!